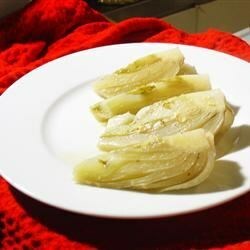 "A great side dish for fennel lovers, originally from a friend in Israel. I have used water instead of broth, with some added salt and seasoning. I have also replaced the mustard seed with regular mustard." Place the fennel quarters in large deep skillet with the centers facing up. Drizzle with olive oil then pour in the chicken broth, honey, and wine. Season with mustard seed, salt, and pepper. Cover and cook over low heat for 45 minutes, turning occasionally. Delicious, subtle fennel flavor! I boil rice in the leftover liquid after and serve the fennel on top. Yum! Delicious and simple recipe. I used water because I didn't have broth, but it was still great. It's so nice to take a break from the more common veggies. Thanks! Perfect recipe. In the last 15 min or so, try adding in yellow squash. They are great together, and when served with lightly spiced chickpeas, you've got a great meal. I had to increase the heat to a simmer and extend the cooking time to make sure the fennel was tender, but this was delicious.